This weekend we happened to meet the owner of one of our favourite restaurants, TJ Tex Mex. He said have you tried the burger? We love burgers but it was an obvious ‘no’ as we go to this place for Mexican food, not burgers. He claimed the burgers were outstanding. 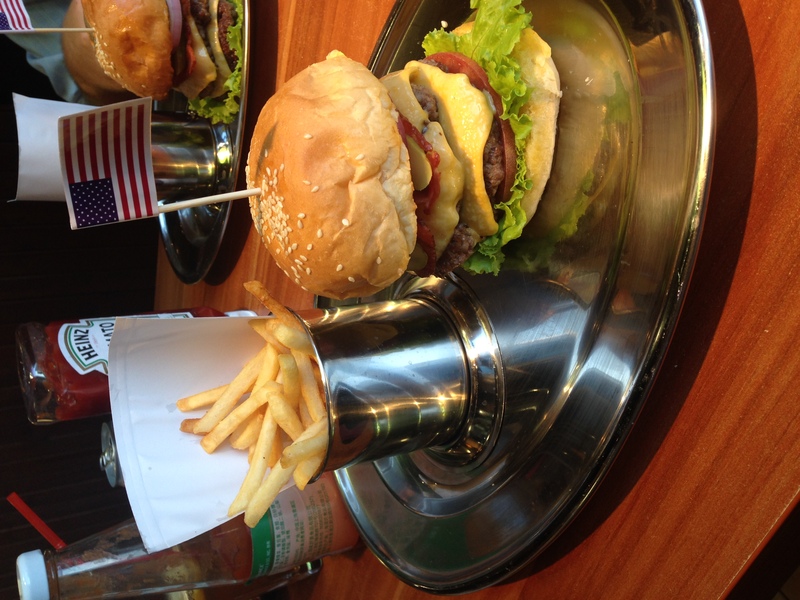 As we thought about it we couldn’t think of an outstanding burger here in Tianjin so we of course had to try it out. We popped into Joy City after work today and took the plunge. We can confirm it is an amazing burger, a very close rival to the Great Leap burger in Beijing. Good ingredients all around but the meat spoke for itself, it was juicy, well seasoned and cooked perfectly. Hot, crisp and salty fries on the side, it was as if we were sitting in a diner back in the states. 55 rmb for this tasty, treat. Tianjiners – go check it out. -Best Burger: Gang Gang (next to the Somerset Olympic Tower), forget best in Tianjin, quite possibly the best burger I’ve had in recent years (around Asia, Europe…I’m USA based). Thank you! We visited Gang Gang this weekend, and really loved it. Haven’t tried the burger there yet but loved everything there. It’s James, the owner of TJ Tex-Mex. This message was just sent to me, hence the late response. I wanted to let you know how happy I am thatI you guys took my advice to try the burger. I’m even happier the burger lived up to the expectations I set. I just wanted to say thank you so much for taking the time to write about this in your blog. Doing something very good in Tianjin is like trying to climb Everest everyday. Please know that if you ever come back, I promise you that we will still be climbing. Best to you guys on your future travels. Not sure if you remembered us but we met ypu at Katies engagement party! We still think the burger is the best and consistencey is a strength of your restaurant! We look forward to trying a pizza next time we visit!!! Of course I remenber u guys! I was talking to an acquaintance about your tough situation teaching to rich snobs in the Middle East. Again, thanks so much for the support. Check out the pizza. It is pretty good by my standards (and mine are pretty high). We’ll be launching some beautiful dishes in the late spring/early summer. I’ll be looking forward to hearing what you have to say. Wish you and the baby all the best!